A reminder that God is Great and miracles DO happen! Five miners are buried in a cave-in for five days. All five are rescued and found in perfect health. They attribute their deliverance to Our Lady of Czestochowa's intercession. A man sentenced to be executed is given a small picture of the Madonna of Czestochowa. With tears in his eyes, he promises to serve Our Lady if his life is spared. All ten bullets shot by the firing squad strike his chest and fall harmlessly to the ground. In The Glories of Czestochowa and Jasna Gora, read about these and many more miracles attributed to the powerful intercession of Our Lady of Czestochowa. 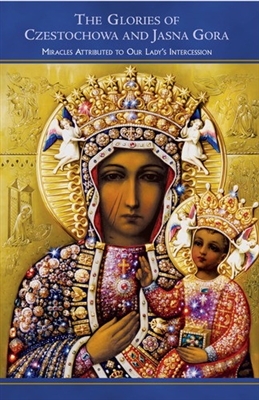 Also, read the fascinating story behind Our Lady's miraculous image that has been preserved for centuries at Jasna Gora in Czestochowa, Poland. Discover for yourself why Our Lady of Czestochowa is for the Poles what Our Lady of Lourdes is for the French, and our Lady of Fatima is for the Portuguese.